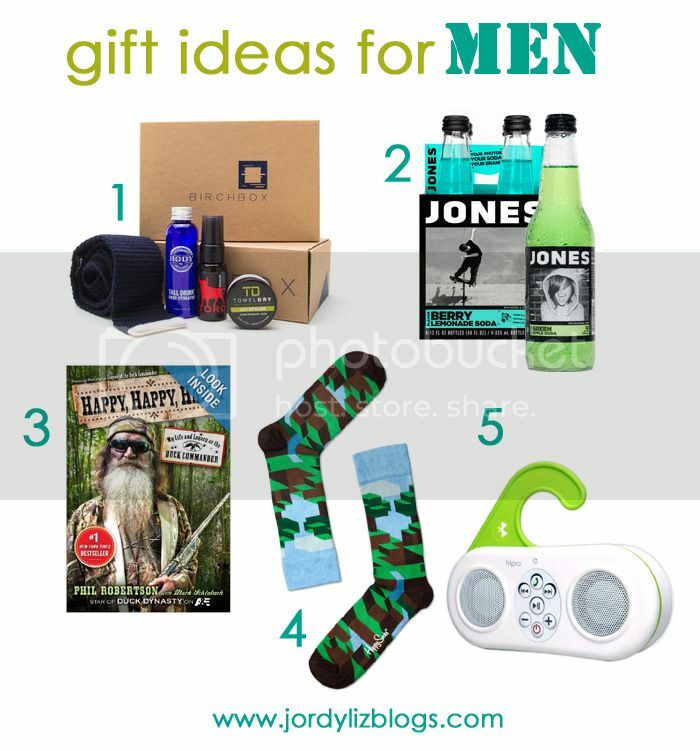 Jordy Liz Blogs: Gift ideas for men. Over the last two days, I gave you ideas for gifts for women and gifts for babies. Today, it's all about the men! 1. Birchbox Gift Subscription // This is a fun box subscription for men that comes with neat toiletries and fun "guy" stuff. 2. Customizable Jones Soda // Everyone loves Jones Soda, right? You can make custom labels with the text and photo of your choice. A great gift for any occasion! 3. Happy, Happy, Happy by Phil Robertson // I love Duck Dynasty, and so does my husband. This book is a great behind-the-scenes look at the family. 4. Happy Socks // My husband loves fun socks for daily wear and cycling. They have a huge selection here. What are you favorite gift ideas for men?